Patco Hardware and Lumber‘s Paint Studio provides a boutique-style shopping experience with an expanded, premium line of products in an inspiring array of colors. Paired with the helpful, neighborly advice you can expect at Patco Hardware and Lumber, The Paint Studio provides a world-class paint experience right in your neighborhood. Valspar® Aspire™ interior paint combines paint and primer in this exclusive EverLuxe™ formula for an ultra-durable finish that is easy to clean and withstands wear. This low odor, zero VOC formula has long-lasting color that stands the test of time. Valspar Aspire is available in four sheens and starts at $33.99 per gallon. 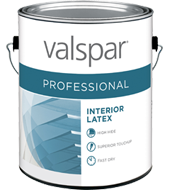 Valspar® Professional is formulated for professional painters to maximize productivity. Available in interior and exterior formulas, its premium-quality, high-hiding finish goes on easy with brush, roller or spray and stays looking great. Valspar Professional is available in three sheens and starts at $18.99 per gallon. The Valspar product offerings are complemented by Clark+Kensington, Ace’s premium line of paint+primer in one, which was rated #1 by a leading consumer magazine in recent tests of satin and semi-gloss interior paints. The Paint Studio features a brand new Clark+Kensington palette of designer-selected colors, along with the original Clark+Kensington mix+match palette, which takes the guesswork out of designing with 120 harmonious colors to choose from. Plus, we still carry Mythic and Frazee brand paints. We can put any color you want into any line of paint we carry!